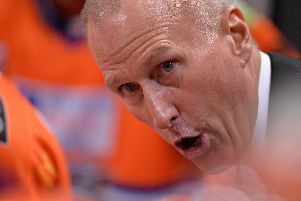 Sheffield Steelers start their domestic season with a powder-keg clash at Nottingham Panthers - so the team’s new foreign legion of imports will face an early baptism of fire. The Challenge Cup game takes part on September 1 - and also offers an early introduction to the ‘derby’ rivalry to Panthers’ new coach Rich Chernomaz. A week later Sheffield start their home sequence in a league match with Milton Keynes Lightning, who will have on loan Steeler Cole Shudra playing against Steelers. Tim Wallace, who misfired for Sheffield last season, will also line up against them. But the real eye-opener is the number of games to be played at the iceSheffield centre...NONE. After the four friendly pre-season games at the city’s public ice venue, Steelers will not play there again for the entire campaign. The midweek games normally held there will now take place at the Arena, and with a cheaper price ticket. In all, there will be six £5 admission matches including the home opener against MKL. The others include fixtures against Fife Flyers, (two) Dundee Stars, Glasgow Clan and Coventry Blaze. “It’s a big change” said owner Tony Smith. “When we signed our new agreement with SIV and the Fly DSA Arena last year we committed to become a full time Arena club. In return the Arena has provided us with a schedule that works and allows us to play our midweek games out of (the) season ticket (arrangement) on one of our special £5 nights. A quick look at the fixture list suggests Steelers and Panthers players will be sick of the sight of each other pretty quickly. In the first 19 games on the schedule, they face each other four times. Manchester Storm who finished above Steelers are in town on September 15. Champions Cardiff Devils, the team Sheffield will have to beat to become Elite League rulers again, are in South Yorkshire for the first time on September 23. New Sheffield goalie Jackson Whistle will have to wait until December to meet his old Belfast Giants employers, they are back-to-back visitors to the House of Steel in the first weekend of that month. Then he will return over the water to the SSE Arena for back-to-backs on January 5 and 6. Paul Thompson’s men wrap up the league season against the Northern Irish on March 24. The Play Off tournament begins on March 6. *Fiver nights: Steelers Special £5 Nights.